The new Weekend Warfare mode for Call of Duty: Modern Warfare Remastered might actually be one of the most ill-conceived and unbalanced game modes in the franchise’s history. 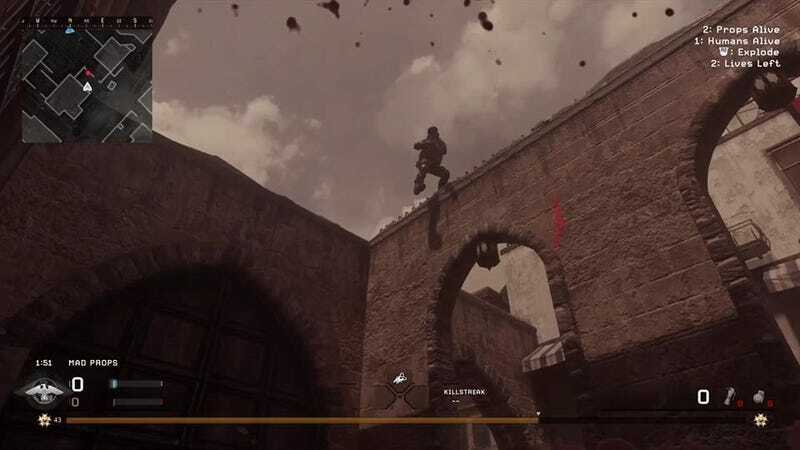 Raven Software decided to create a new Weekend Warfare mode for Modern Warfare Remastered, spinning off the success of the wacky hide-n-seek mode called Prop Hunt, which the community recently voted to keep on as a permanent option. However, the developers missed the mark with the newly introduced “Mad Props” game mode, failing to capture the fun of the beloved Prop Hunt. The charm behind Prop Hunt is the sheer thrill of blending in as props on the map and having the opposing team seek you out, laughing maniacally as you watch soldiers walk right past your perfectly placed trash can or chair. There’s also the paranoia that grips you as the hunter, knowing any one of the trees, cars or trash cans around you could be a player watching your every move. You might even do a double take and fire your gun because you swear a tree moved. Whether the hunter or the hunted, Prop Hunt is entertaining for both sides. With the announcement of Mad Props, I was intrigued by the premise of props hunting the humans. I wondered how it would work to have the trash cans and watermelons chasing soldiers with guns. My conclusion? Although it certainly looks funny on the screen, it doesn’t work at all. Mad Props takes the same Team Deathmatch style formula as Prop Hunt, with players taking turns as both props and human soldiers, but now the props are trying to hunt the humans. The props themselves are explosive devices, and the only way to kill anyone is to get close enough to detonate your prop near an opposing player. In other words, the humans that are supposedly “hiding” in Mad Props have access to all the guns and character classes in the world, whereas the “hunters” don’t even have any ranged weapons at all. putting the Props at a terrible disadvantage. There is absolutely zero enjoyment in trying to dart across the map as a piece of trash and trying to explode next to an opponent armed with guns and claymores. I understand how absurd it would look if random items, such as watermelons or paint cans, had ranged weapons. But this mode won’t really work unless Raven Software can give the props a better attack method, or severely limit the arsenal of the hunted team. Almost every map in Modern Warfare Remastered has tall buildings, crates, or other items for the soldiers to stand on and remain above the blast radius of the props. The Props get three lives each to attempt to win the round by killing all the human opponents, who only receive one life each. However, one life is all you need to survive to on a rooftop with your team. Take a ladder or stairs up to a roof, plant some claymores, and the game is like shooting fish in a barrel. The props in Mad Props seem to move slower than they do in Prop Hunt, so you’ll likely kill them before they ever reach the building. It’s so easy and terribly boring. The unbalance here is unreal, and I can’t image why Raven Software would even think this concept would work. Many fans stormed over to Twitter with their pitchforks to rage about the poor execution of the Prop Hunt spinoff. If you want to gain XP in the most boring way possible, Mad Props continues until Friday, August 25.